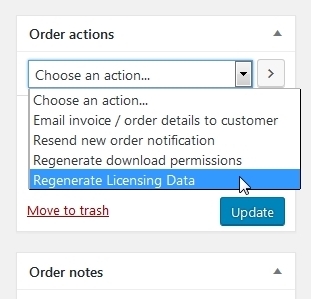 When creating new order either through admin or customer check-out, the licensing information is being created for each product and saved as WooCommerce order item meta field. The licensing details are used later when interacting with API or displaying detailed information about licence, like customer account. Over the time, the order can change by add or delete specific product within, to match customer requirements. That do not trigger the licence data update automatically, to ensure back-wards compatibility is maintained and previous licensing data is maintained in place as generated on the start. For that reason a new option has been introduced within WooCommerce Order Actions selection. This can be used to generate a new set of data of all products which are available in the order at the time of trigger. Another usability for this feature is when changing the original product licensing data. The existing orders which include the products are not adjusted to ensure old packages stay in place and customer can use what he had payed for. But if the new changes are required to become available for previous orders, this can be triggered accordingly.